Indie developer Karios Games is known for updating its games numerous times based on customer and reviewer feedback. Case in point: after our MonsterUp Adventures review ran recently, the developer immediately set about fixing some of the review’s criticisms. That update went live over the weekend. It fixes quite a few of our complaints, making a fine jumping game even better. One of the game’s weakest points prior to the update was the gem system. 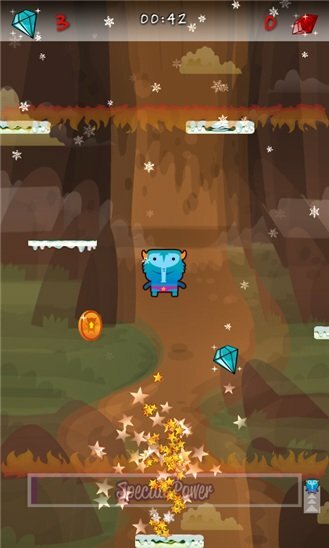 To win a level, the player needs to collect a certain number of gems (diamonds and rubies). These jewels serve two more purposes. One: if the player has enough diamonds when falling off the screen, he or she just loses some diamonds without dying. Post-update, those diamonds get redistributed throughout the level, reducing the possibility of reaching the end without enough jewels to pass the level. Not bad! 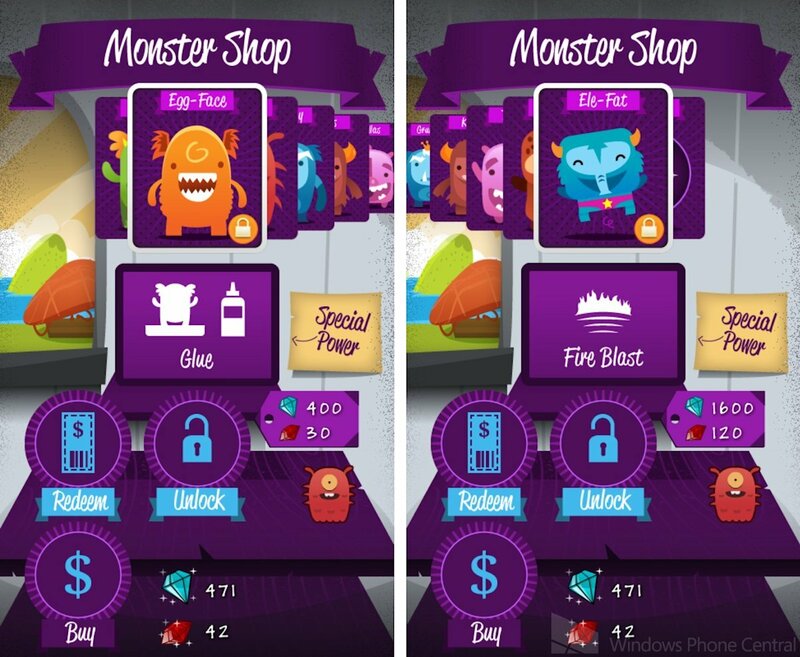 The second use for jewels is unlocking new playable monsters and a free ringtone in the game’s shop. Before the update, everything cost astronomical prices. For example, the most expensive monsters sold for 2400 diamonds and 160 rubies. Now it costs 1600 diamonds and 120 rubies! The price changes don’t solve the problem of the player not retaining any jewels collected when failing the level. That lingering issue makes gem acquisition slower and less addictive than it could be. But at least it won’t take as long to get monsters as before. In our review, I opined that MonsterUp Adventures’ four boss battles were so bad, the game would be better off without them. Well, now they’re not quite that awful! Karios has added a continuous row of platforms near the bottom of the screen, making it impossible for monsters to fall through the bottom and die. You can glimpse these platforms in the pictures at top. Also, jumping through either side of the screen makes the monster come out the other side, just like in normal stages. Dodging and attacking bosses is still less intuitive than standard platformers since the player’s monster never stops jumping here. But the increased range of movement really reduces the frustration of fighting bosses now. Not everybody wants to grind for gems to unlock new monsters. As such, the developer has always sold gems as optional PDLC. The real money prices are already pretty low, but there’s currently an even better deal. Using the coupon MONSTERUP30 at the MonsterStore website, you can get 30% off the standard gem bundle prices. As an example of the potential savings, a user can grab 2000 diamonds and 200 rubies for only a dollar after coupon. That’s enough to unlock the best monster and the cheapest monster (both pictured above) with a few rubies left over. The coupon is valid for a limited time only, so if you’re itching to unlock some monsters, hop to it! 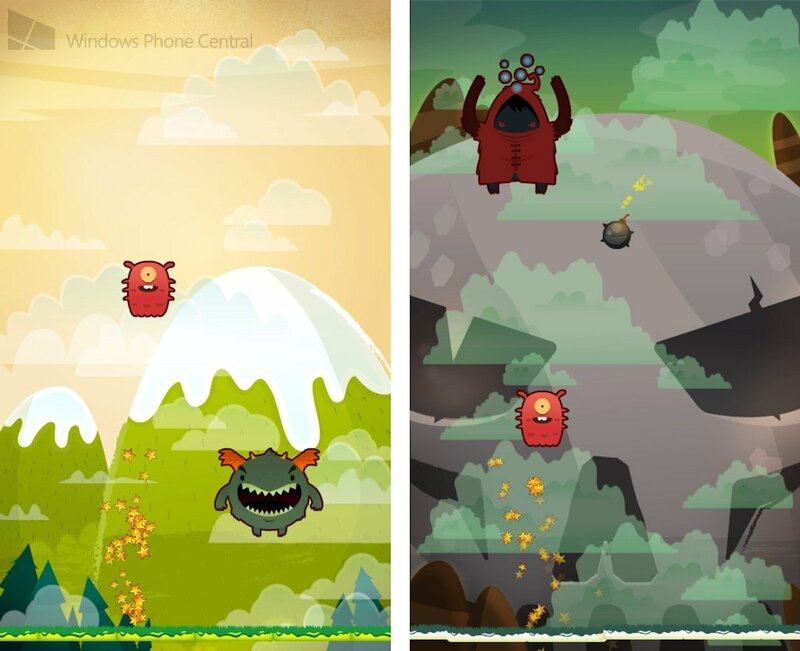 MonsterUp Adventures costs $1.99 and works great with WP7 and WP8. Grab it here at the Windows Phone Store.